With all these benefits, I HAD to develop a smoothie recipe and I honestly can't get enough of it lately. 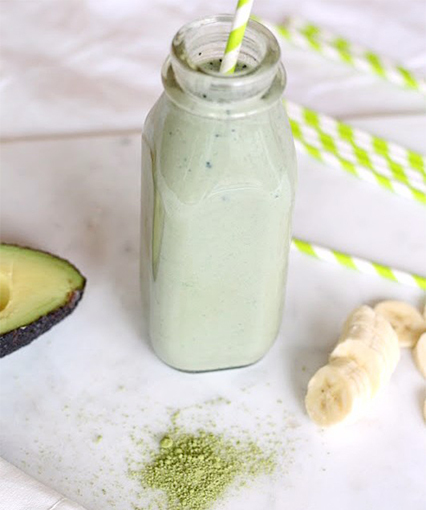 It is creamy, delicious, filling and as a major bonus -- especially for those of you who have a hard time rolling out of bed in the morning -- the caffeine boost. What is matcha all about and why is everyone calling it a superfood? Matcha is a fine, green tea powder originating from Japan, but unlike traditional green tea leaves that are steeped, the entire leaf is harvested, processed and consumed. - Abundant Antioxidants: Matcha is loaded with antioxidants called polyphenols, which have been linked to a decreased risk of cancer and heart disease. In addition, antioxidants fight off reactive oxygen species in the body that wreak havoc on body cells. In short, antioxidants protect and prevent cells from oxidative damage. - Immune Support: Due to the health-boosting antioxidants, amino acids and other compounds contained in matcha, research suggests that matcha has an anti-inflammatory effect on the body and may boost overall immune responses. - Mood boosting: Research suggests that the serotonin and the amino acid L-theanine found in matcha may help to lower anxiety and boost one's overall mood. - Heart Healthy: Out with the bad, in with the good. Studies show that the antioxidants found in matcha may work to disrupt cholesterol absorption from food in the gastrointestinal tract, therefore contributing to lower LDL (bad cholesterol) levels circulating through the blood. - Pick Me Up: One cup of matcha contains roughly 68mg of caffeine, while its traditional green tea counterpart only contains 32mg. Compared to a cup of black coffee (which contains around 100mg of caffeine), matcha could be a good alternative for an energy fix! 1. Combine all ingredients in the blender and blend on high until smooth, about 1 minute. Want a free copy of "Lindsayjang.com Top 10 Recipes Cookbook"? Click here for your free instant downloadable copy! For more recipes and kitchen inspiration, check out www.lindsayjang.com or find Lindsay on Instagram here or Facebook.